9ct two colour rope necklace. Crafted from stunning 9ct yellow gold and sleek 9ct white gold for a contemporary chic contrasting look. An elegant accessory for any occasion. Clasp may vary. 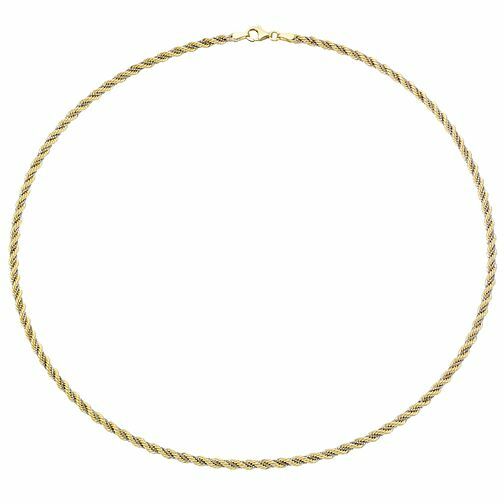 9ct Two Colour Gold 18" Rope Chain is rated 5.0 out of 5 by 1. Rated 5 out of 5 by Anonymous from Pretty necklace Wasn’t sure if I would like it when I saw it in the box. Put it on & it looks lovely. Wish I had bought the 20” though. Very happy with this purchase.